If you’re like most digital photographers, a very small percentage of your photos will ever escape the confines your computer. After all, there are only so many places you can hang a photo. But if you think that 4-by-6-inch prints are all your photos are good for, it’s time to think outside the frame. This holiday season, why not dig out some of those photos languishing in your iPhoto library and put them to good use as photo gifts? From calendars to memory boxes to personalized diaper bags, there are dozens of creative ways to use your favorite photos. Want to really put your photos to work? One thing you can do is create a 20-by-30-inch poster containing several dozen photos. If corralling all those photos sounds like a lot of work, don’t worry. OS X 10.4’s Automator will do much of the work for you. Before you can get started, you’ll need to have iPhoto 5 running on OS X 10.4 (Tiger). Automator Action and Workflow Because assembling photos by hand would require a lot of tedious work, I’ve provided an Automator action that does the job for you. You'll need to download the Thumbnail Poster action and the completed Automator workflow for this project. On your Mac, find the downloaded Thumbnail Poster Installer file and double-click on it to install the action in Automator. When you launch Automator (it’s in your Applications folder) you’ll find the action in the PDF section of the Library pane. All Together Now Forget showing off one photo at a time. This poster displays 72 of your favorite horizontally oriented rectangular photos at once. You can also create a poster that includes 96 cropped square photos. Hard-Drive Space The image file that this workflow creates is big —a few hundred megabytes. To help the workflow run efficiently, make sure you have at least a gigabyte of free disk space on your Mac. The first thing you need to do is gather the photos you want to use into a new iPhoto album. If you’d prefer to not crop your images, you can use only horizontal or only vertical shots. Because the images will be larger than cropped square images, you won’t be able to fit as many of them on the poster—you’re limited to 72 photos. However, the workflow will run much faster, since iPhoto won’t have to go to the trouble of cropping. Organize the Photos After you’ve added 96 shots (or 72 if you’re going with all horizontal or all vertical photos), arrange them in the order in which you want them to appear on your poster. A 96-shot poster will contain 12 rows of photos, with 8 photos per row. (A poster of 72 horizontal images comprises 12 rows of 6 photos, and a set of vertical images will be in 9 rows of 8.) You could choose to devote each row to a specific theme or you could take a month-by-month approach. You could also forgo precise planning and just mix and match your favorite shots. To see an approximation of how each row of photos will look, use the size slider in the lower right corner of the iPhoto window to resize the photo thumbnails so that eight thumbnails appear from left to right. Tip: The square thumbnails created by the workflow may cause some unwanted cropping. You can crop each of the 96 images manually, using iPhoto’s Crop tool with the Constrain menu set to Square. If you do this, duplicate every photo first—cropping a photo changes its appearance everywhere. Once you’ve chosen and sequenced your photos, select them by choosing Edit: Select All (or pressing Command-A). Switch to the Finder and open the Thumbnail Poster Files folder. Double click on the file named Create Thumbnail Poster.workflow. The workflow will open in Automator and then scan your iPhoto library. If you’re running it on a slower Mac and you have a large iPhoto library with a lot of albums, you’ll see the spinning beach ball for a few minutes—be patient. With the workflow open in Automator, locate the second action (Create Thumbnail Poster) and select the type of images you want from the Thumbnails pop-up menu (if you’re using 96 images, select Square). In the Import Photos To iPhoto action, specify where you want the finished poster to appear—in a specific iPhoto album or in the general iPhoto library. Click on the Run button in the upper right corner of the workflow window. Your Mac will process each photo, crop them if necessary, render them to PDF files, and generate the poster image. After the workflow runs, you’ll find your poster image in your iPhoto library (and in a specific album if you chose one before running the workflow). Before ordering your print, you can, of course, modify the image using iPhoto’s Adjust panel, Photoshop, or Photoshop Elements. For example, you might want to put a colored border around the montage. To order a print of your poster, select the poster in iPhoto and click on the Order Prints button. The Automator workflow creates an image whose proportions match those of a 20-by-30-inch print. If you order a different size, some of the photos will probably be cut off. Don’t want a 20-by-30-inch poster of images? There are plenty of variations on this technique. 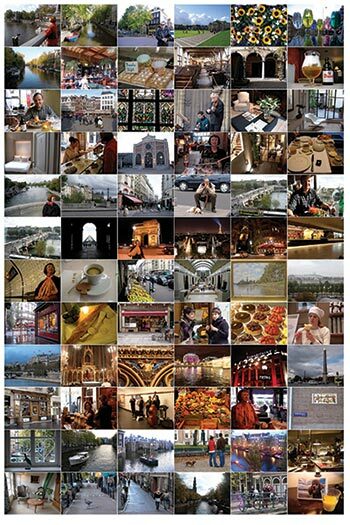 Use iPhoto Contact Sheets You can create smaller photo mosaics with the help of iPhoto’s Contact Sheet print style. First, open iPhoto and go to File: Page Setup to specify your desired page size. Select the photos you want to print, and then choose File: Print. Set the Style menu to Contact Sheet. Use the Across slider to specify the number of photos you want to appear in each row. Click on the Save As PDF button to create a PDF of your mosaic. If you use Tiger, you can have your Mac create a PDF of the contact sheet and then automatically add it to your iPhoto library. In the Print dialog box, click on the PDF button and choose Save PDF To iPhoto. Use Flickr If you’re part of the online photo-sharing service Flickr, you can use John Watson’s Mosaic Maker site to create photo mosaics from photos posted by Flickr members. The resulting mosaics don’t have a high enough resolution to produce a high-quality print, but they’re great for e-mailing or posting online. With Flickr’s new printing services, you can also order a 13.5-by-19-inch poster. EDITOR’S NOTE: Want more digital photo tips? We’ve created a PDF file bursting with advice about every aspect of digital photography. And so we’re proud to announce the release of the Macworld Digital Photography Superguide, which features material from an all-star cast of writers.